Many people will never need to hire a litigation attorney. Those who do usually find themselves in unenviable circumstances—they are getting a divorce, they have been wronged and are seeking rectification, or someone else is accusing them of doing wrong. This means that many people who hire an attorney have never done so before and are not sure how the process works. One common question they have is how the attorneys get paid. Like all other good questions, the answer depends. For one thing, not all attorneys are litigators, and not all litigators bill the same way. However, as a general rule, litigating attorneys either bill by the hour, at a fixed rate, or on a contingency basis. Attorneys who bill by the hour set an hourly rate then track their time spent on a given matter, which time is billed at that hourly rate. Many attorneys will bill in tenth-of-an-hour increments, so everything up to 6 minutes is 0.1 hours, from 6 minutes up to 12 is 0.2 hours, and so on. Although rarer, some attorneys bill in quarter-of-an-hour increments, so anything up to 15 minutes is .25 hours, up to 30 minutes is .5 hours, and so on. The Nevada Rules of Professional Responsibility require that the attorney communicate the basis or rate of the fee and expenses to the client before or within a reasonable time after commencing the representation. An attorney’s hourly rate varies depending on the attorney’s skill and experience, the area of law, and the complexity of the issue. Hourly billing is the billing method through which the attorney accepts the least amount of risk of getting paid. Corporate cases, family law cases, and contract cases lend themselves to hourly billing. Many tort cases are also billed by the hour, especially if the attorney is representing the defendant. The advantage to the client of an hourly fee arrangement is that the client is only paying as much as the case requires in the attorney’s time. And at the end of the case, if the client prevails and is a plaintiff, 100% of everything collected goes to the client because the attorneys have already earned their fee. There are some disadvantages as well, particularly in smaller cases, the cost-to-benefit ratio may not justify hiring an attorney at all, which means that many people cannot afford to pay an attorney even though they may have a legitimate case. Moreover, neither the client nor the attorney know how much the representation is going to cost because it will depend in large part what actions the opposing party takes throughout the case. Some attorneys will bill at a fixed fee or flat rate. They advertise providing a service for a certain price. For example, an attorney may offer to handle an uncontested divorce for $1,500. The advantage to the client of fixed-fee billing is knowing ahead of time what a case is going to cost. In many transactional arrangements—preparing a contract, a will, a trust, for example—fixed fee arrangements are very common and probably the most economical. This is not the only disadvantage. Although an attorney is assuming part of the risk in a fixed-fee case (the risk that it will take more time than anticipated, resulting in a lower rate of return), this risk is going to be built in to the price, so chances are if it is as simple as the client hopes, the attorney is making more than it would if he just charged by the hour. Plus, the moment the attorney gets paid, he has a disincentive to put much time into the case because his payment is the same regardless of the effort expended. 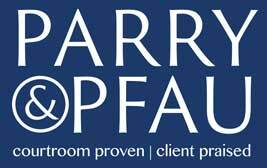 Fixed-fee arrangements make sense in transactional law, but because of the disadvantage to the client in a litigation case, Parry & Pfau does not utilize flat-rate billing in litigation cases. When an attorney takes a case on a contingency fee, the attorney agrees to do the work on the case without billing the client during the pendency of the case in exchange for a percentage of whatever is ultimately recovered from the defendant. Because the attorney’s fee is dependent on recovery these arrangements only work when the attorney represents the plaintiff. Attorneys will not generally represent a defendant on a contingency because even if the defendant wins, no money changes hands, and the attorney’s share would be nothing. In a contingency arrangement, the attorney must assume the risk that the plaintiff’s case has merit, that the plaintiff will prevail, and that the defendant has assets that can be collected. As a result, attorneys are usually only willing to take contingency cases where the defendants have deep pockets, like large corporations or insurance companies. Attorneys also generally require a percentage of the total recovered that will justify their time, effort, and risk. The contingency percentage varies based on a number of factors, but most attorneys who charge on a contingency do so for about 33%, which percentage increases if the attorney has to file a lawsuit, go to trial, or file an appeal. The obvious advantage of a contingency arrangement is that the client does not have to come out of pocket for the attorney’s representation—the defendant pays the attorney at the end, if at all. The principal disadvantage is that because the attorney is taking a bigger risk, the attorney often ultimately gets paid more than he would have if the plaintiff had just paid an hourly rate. Ethical rules prohibit an attorney from taking family-law or criminal cases on a contingency basis. Contingency cases are most common for personal injury plaintiffs who have been involved in an accident covered by insurance. Before retaining an attorney, make sure you understand the basis of the billing arrangement. And don’t be afraid to negotiate with the attorney. There are a lot of attorneys out there vying for your business, so if one attorney insists on billing in quarter-of-an-hour increments, find one who will bill by the tenth of the hour. If you think the contingency is too high, try to negotiate a lower one knowing that there will likely be an attorney out there willing to take a lower rate. And be wary before you hire an attorney on a flat fee for a litigation matter—chances are the fee you are quoted will not be the last “flat fee” you have to pay. Also take into account that not all attorneys are the same. Some charge a higher rate because that higher rate is justified given the attorney’s experience and track record. You can learn a lot about an attorney online and through word of mouth and a personal consultation. In the final analysis, it doesn’t really matter how the attorney gets paid, but rather what kind of representation that payment purchases. Newer PostAttorney’s Fees—What’s the Deal? Older PostThe U.S. Patents and Trademarks Office Canceled the Washington Redskins Trademark—What Happens Now?